Nomos Glashütte is small but powerful. 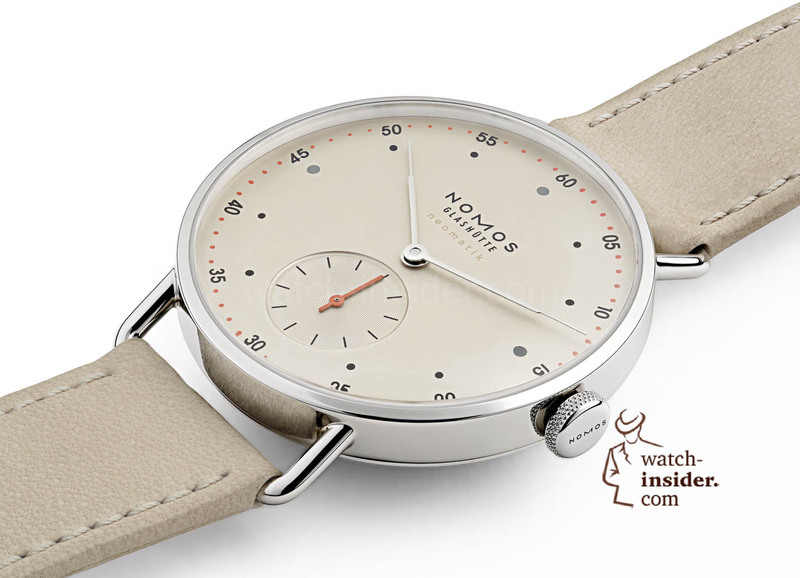 Nomos Glashütte is a 100 % independent manufacturer. Nomos Glashütte is a 100 % in-house watchmaking company. Nomos Glashütte watches are not expensive. Roland Schwertner founded Nomos Glashütte in 1990. Today Nomos Glashütte belongs to five partners – with four of them working there. Therefore the company is independent and not part of any small or big group. 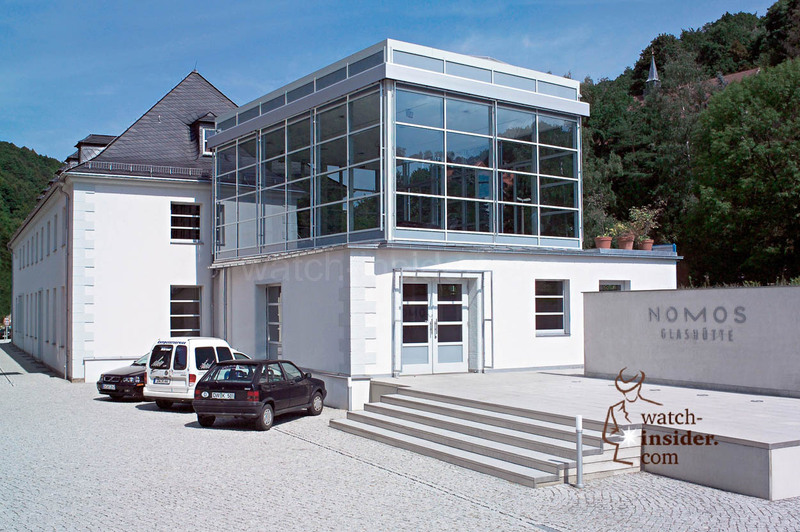 Nomos Glashütte currently has a staff of 250 employees. 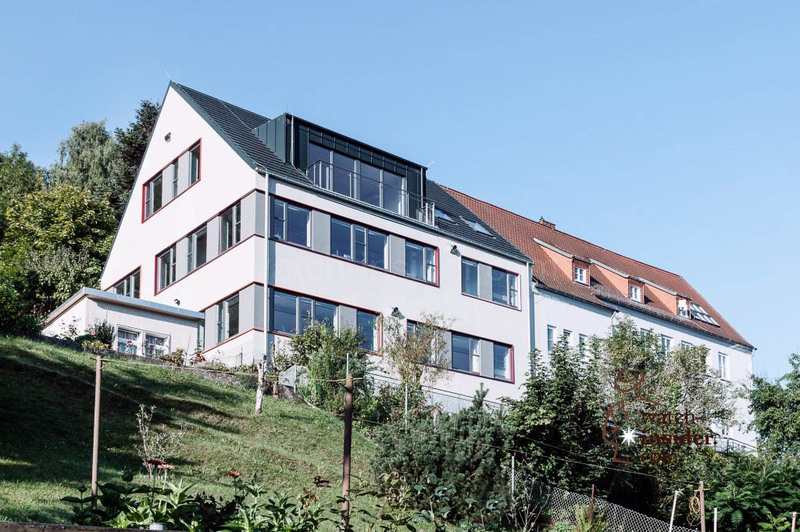 The great majority of them, around 220, work in Glashütte – including the company’s own department for research and development. Nomos in Glashütte Saxony in Germany. That´s the old train station of Glashütte. The Nomos Chronometry in Glashütte Saxony in Germany. The department for research and development is responsible not only for the development of calibers but also for their extreme production depth. Furthermore, it can take credit for several patents. Over 30 employees work for the subsidiaries Nomos Glashuette USA in New York and the in-house creative agency Berlinerblau in Berlin, which is responsible for branding, designing watches, and everything else that goes with it. Nomos Glashütte is a watchmaking company that makes almost everything in-house. 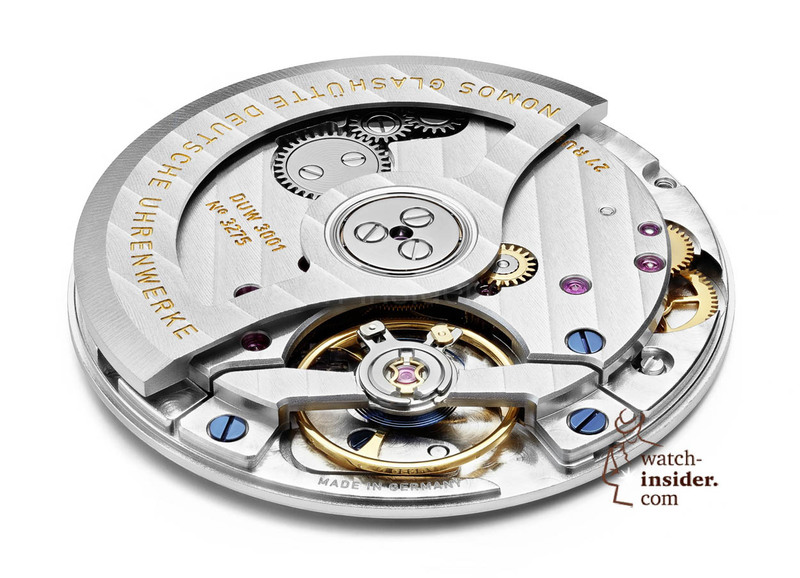 All ten calibers for instance are proprietary and produced on-site in Glashütte. 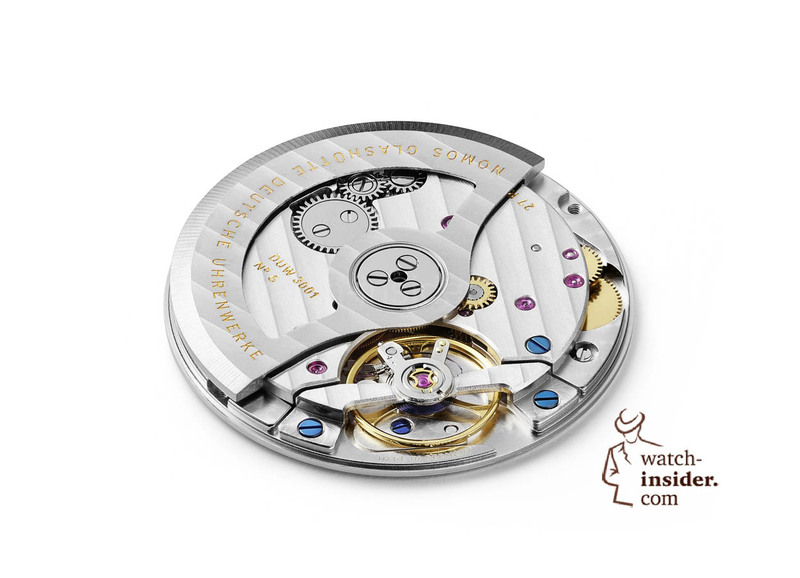 Nomos Glashütte can therefore ascertain the quality of its calibres. The timepieces are crafted without external know-how and with a proprietary escapement, the so called Nomos swing system. This makes the company technologically independent. Already in the near future, all Nomos calibers will be equipped with the Nomos swing system, easily recognizable due to its blue balance spring. The new and extremely thin automatic caliber DUW 3001 is the latest caliber developed and manufactured. This movement ticks in the nematic series. It raised the bar, since many automatic movements by other producers are considerably larger, less precise, or markedly more expensive. The latter often due to the fact that calibres cannot be produced in series. With DUW 3001, Nomos Glashütte will grow further, since in the future, automatic timepieces will make up the larger part of the production. 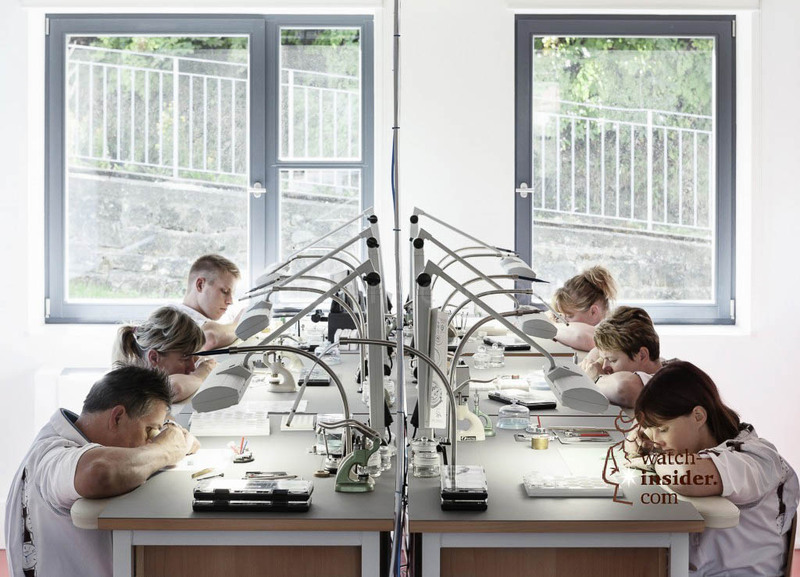 Nomos Glashütte watchmakers at work. This is the department of complications. The Nomos Glashütte collection consists of twelve model families with around 80 watch versions; mechanical timepieces in the price range of 1,000 to 4,000 Euro. The two haute horlogerie models in 18-carat rose or white gold, Lambda and Lux are the cherry on the cake. 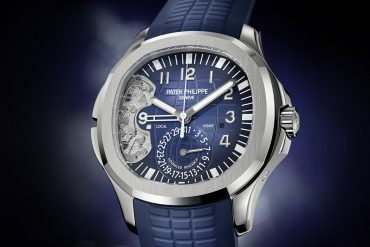 Only three of these timepieces are crafted a week and they cost between 12,800 and 15,800 euros. Most Nomos watch cases, however, are made from stainless steel and retail for under 4,000 Euro. 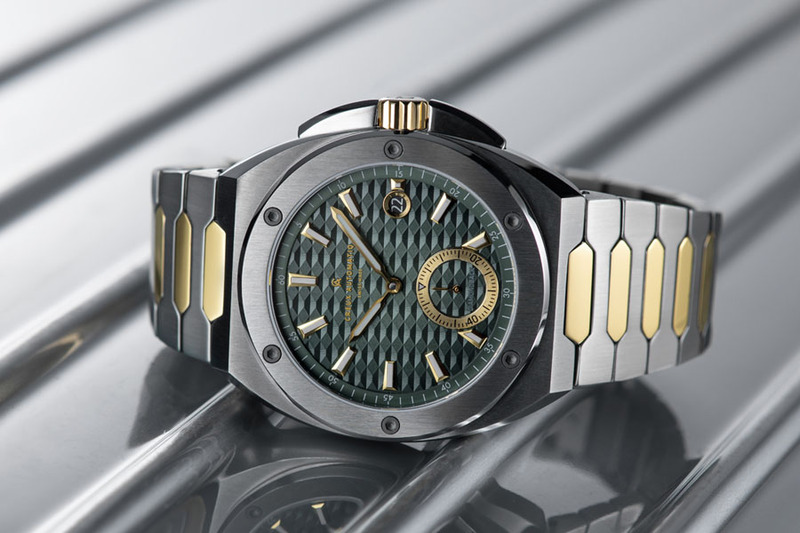 Whether in gold or in steel: All timepieces represent an outstanding watchmaking craft, top quality materials, modern design, and an excellent value-for-money ratio. 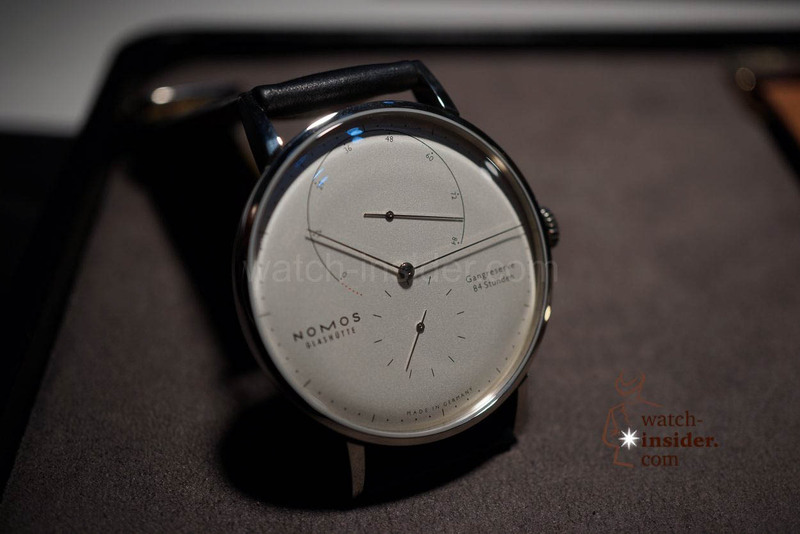 Therefore the demand for Nomos watches is growing constantly – counter to the actual industry trend. In 2015 the company grew once again by around 30 percent and now makes an estimated turn-over of more than 50 Million Euro. In terms of quantities Nomos Glashütte is the largest producer in Germany and in the price range of 1,000 to 4,000 Euro globally one of the market leaders in mechanical watch sales. If you need to know the price of a specific model, please let me know. I will provide you the requested prices in Euro in the comment section. The watches today are exported to over 40 countries worldwide. 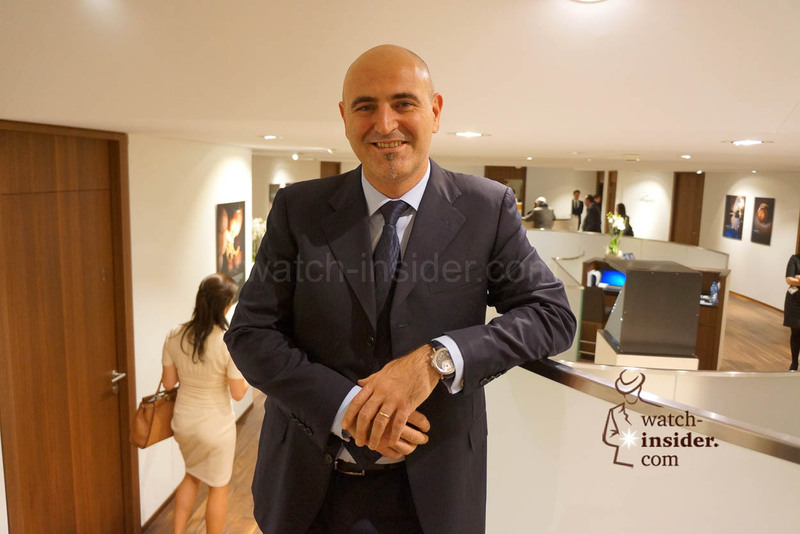 Currently Nomos Glashütte is concentrating on rapidly expanding its US business. More employees are joining the company both in North America and in Europe. The aim for the company is to continue its twofold growth in size every three years, and for the brand to gain more recognition. 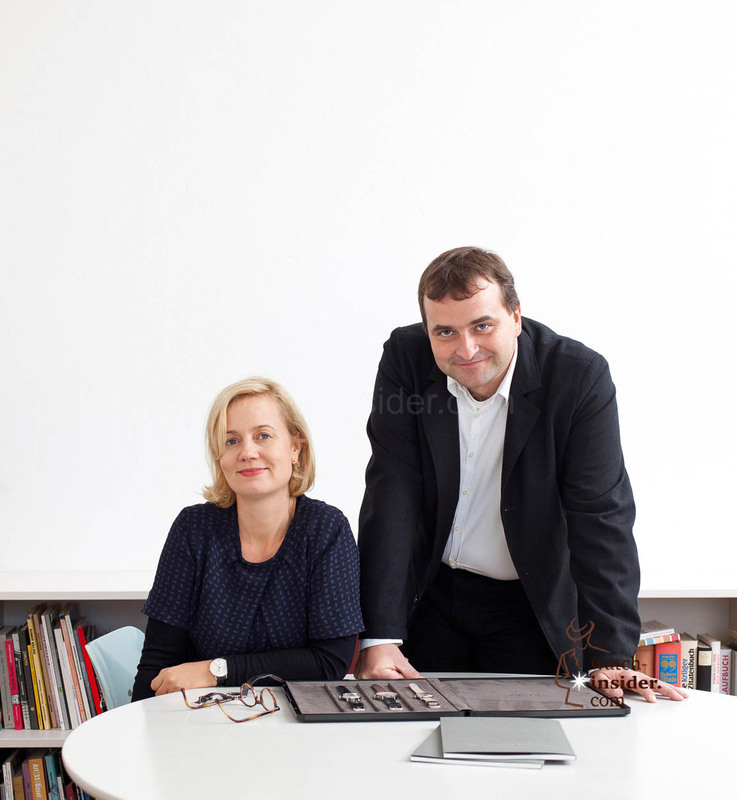 Nomos chief designer Judith Borowski is responsible for the straightforward German product design with a dash of Berlin: Renowned designers such as Werner Aisslinger, Mark Braun, and Axel Kufus work and worked along-side young creatives on the best timepieces. The work of the design team has been recognized with over 130 international prizes and awards – including the iF Product Design Award, Red Dot, and the Good Design Award, each multiple times. From left to right Metro, Minimatik, Ludwig, Tangente, Orion and will keep being produced with a white silver-plated or, as pictured here, champagne-colored dial. Joining them is the Nomos classic Tetra, glaring with its beautiful deep-blue dial. After the success of the first edition the neomatik collection is extended: All timepieces are powered by the ultra-thin automatic Calibre DUW 3001. Besides a few changes made in relation to the first edition, the collection of self-winding watches is now complemented by model Tetra. Pictured here are the white silver-plated models of the Nomos automatic class. Hands on the new Nomos Lambda and Lux. 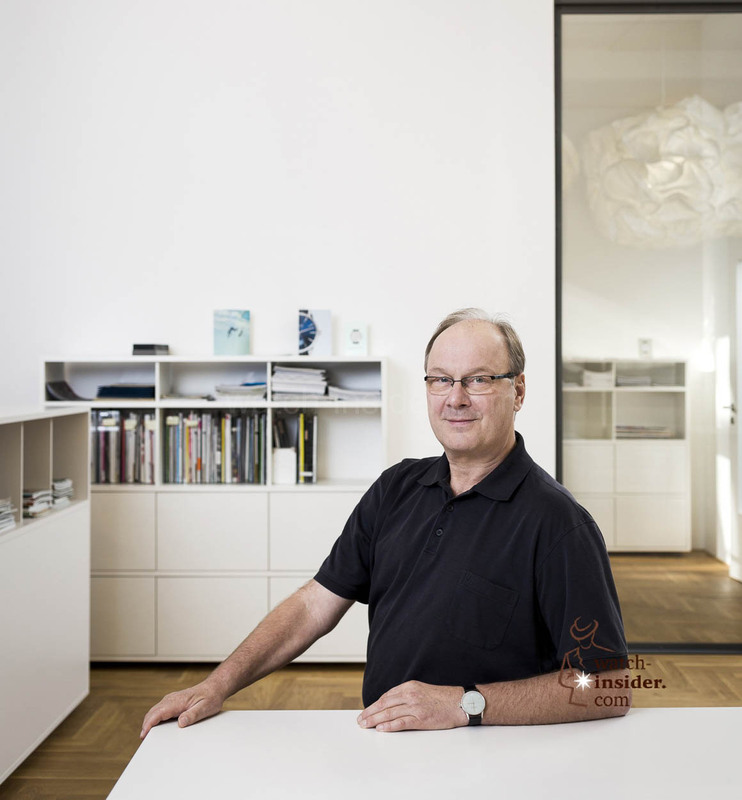 Interview with Merlin Schwertner, the son of Roland Schwertner, the founder of Nomos. I own four automatic Nomos and I am very happy with them (As a Swiss I should not say that!). Best design (with or without date!) with Bauhaus-feeling, top quality, high precision, refreshing marketing with ä great touch of humour (What you really don’t expect from the Germans!). And best prices too. Next buy will be a Nomos with the DUW 3001 for my wive, so she will stop picking me “my” Nomos watches all the time. Apart from creating fabulous watches at affordable prices, Nomos is one of the very few watch companies that produces its own hair-springs. I have this thing about seeing a watch in person before taking the plunge and making another 4 figure purchase or I might already have one. Great watches and excellent value for the craftsmanship and service you receive. I started about 15 years ago and have various versions of the older 35mm manual wind models. Always got compliments. My boss who wore a patek couldn’t believe how nice my Orion was for a fraction of the cost. Designs are excellent, keep time very accurately and not everyone has one. In 20 years, I have never seen another person with one in the states. Now they are carried at a nation wide chain. I retired and moved to the beach so they don’t get worn as much since the sea and sand would ruin them but the Orion is one of my all time favorite watches! I didn’t see it listed on the Nomos site. Steve, If you have a Tourneau store in your city, they have the Nomos in their stock. Great watch. I have an Ahoi with the blue dial. 200 meter watch that looks like a dress watch. By far…my NOMOS watches are the best ” bang for the buck “, hands down ! The fit , finish, accuracy and clean minimal dial designs create a very legible read. 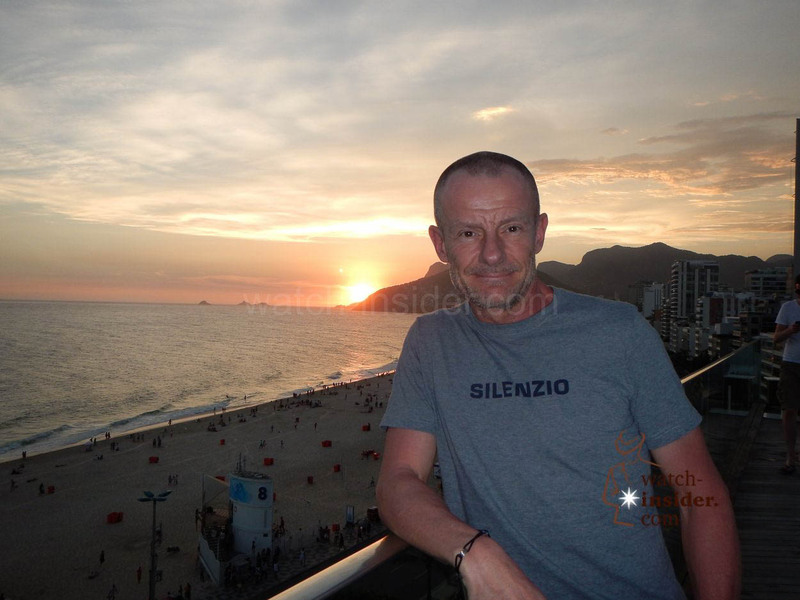 To top it off, this manufacture provides excellent customer support should you need assistance for any need. Love this brand. Glad to see they are expanding their presence in North America.. Stay the course NOMOS….you are doing everything right ! I too like Nomos. It’s interesting that Nomos is quite popular in the USA. 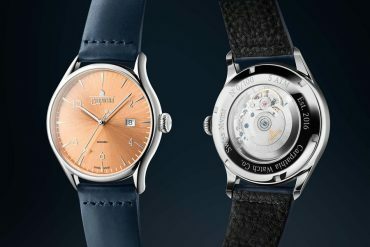 Is it just marketing or trendsetting or some cultural phenomenon that makes one type of watch popular in one particular country as opposed to another? Just wondering. By the way I like my Metro also.